I am very happy to announce that I am just gone 3 months pregnant! This has been one of the reasons why I've not been posting as much to this blog as I would like - I've needed to spend any free time sleeping instead of crafting. However, I still have grand plans to craft lots of cute baby related items, clothes, booties and little blankets so any time that I'm not dosing off on the sofa I will be diligently making pretty things. 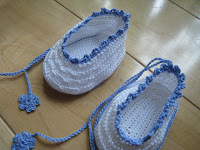 Like these very sweet little crochet booties from the "Kyuuto! Lacy crochet" book. I love the look of the projects in this book - such pretty items which look so simple. Sadly the instructions that go with them are hideously complicated - it took me three separate attempts before I successfully finished my first bootie. I love the idea of the clear crochet diagrams, but perhaps because this is thread crochet the detail on the diagrams is really very small and difficult to make out at times, especially with the crochet that is in a round - it is so difficult to make out which row you need to be working. There are also written instructions, but these have obviously been translated from Japanese and are quite basic as they rely heavily on the diagrams to give you all the detail you need. Lastly - these booties are made in two separate pieces, the sole and the sides which are joined together with the second colour thread at the end. Why on earth would you want to make them this way? Surely you could do them all as one piece and then add a nice colour edge round the bottom which would have exactly the same effect. I really do love the finished look of these booties - but I can only hope that I have a boy as there is no way on earth that I will go through making these again. You don't normally get the best out of poinsettias in April - but not in my flat... nope, in Jess land time has stood still for a good 4 months. As you can see I'm still doggedly working my way through a list of UFO's and this is one that I started way back in December but didn't have the heart to finish. 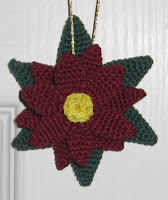 Nothing to do with the pattern though (which is freely available on the PlanetJune blog), I made life much harder for myself by deciding that I wanted to make it up in crochet thread and have it as a tree decoration. In the end I think it was well worth all the effort, I love the chunky 3D nature of this decoration and I can't wait till December to show it off to my friends and family. But for now this will be the last late Christmas decoration that I'll be making up, best move on to some of my other patiently waiting projects. I'm so sorry for the lack of posting recently - I've been in a complete craft slump and I have not made a thing! Hopefully that slump is now on the way out though as I finally got round to patching one of my husband's slippers. Why does it need a pirate eye patch? Heck, why do the slippers have goggly eyes at all? Well, Rich wanted the eyes, and they have been on there for quite some time, but a while ago he managed to knock one of the eyes off and then got it into his head that it would be cool to have a pirate eye patch for it instead.